The Press of Robert LoMascolo: Wells College InDesign Workshop . . .
Wells College InDesign Workshop . 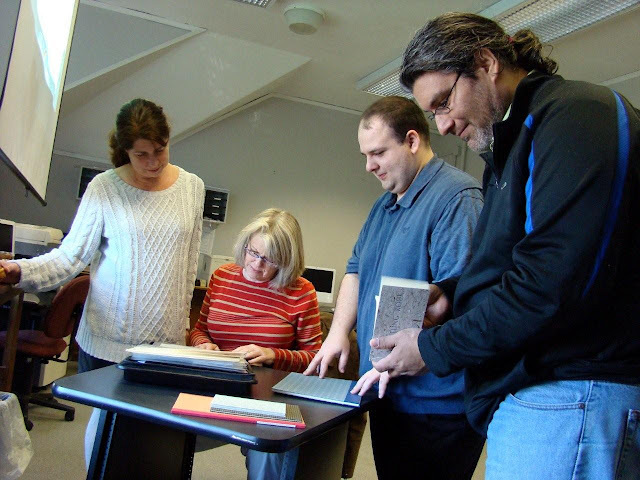 . .
Three of the five participants at Robert's Wells College InDesign Workshop, on March 30th gather around to see some of Robert's work. Participants developed their own projects including posters, magazine mockups, and small books. Everyone had a great time, and learned a lot. If you would like to have an InDesign, Letterpress, or Book Arts related workshop or lecture at your event, let us know. Additionally, stay tuned to this Blog for announcements on Rob's upcoming classes and presentations.